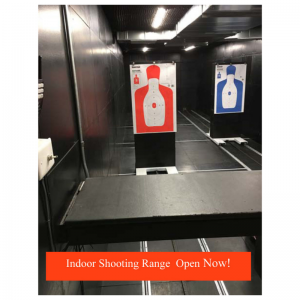 We have Two Safe, Clean, Comfortable Shooting Lanes. Both lanes have an automatic target retrieval system with 4 shooting points 3 yard, 5 yard, 7 yard and 10 yard. You will need to bring your Gun, Hearing protection and Eye protection. We will sell you the Ammo, Targets and Range Time. The Zack’s Sports Inc. Indoor Range Waiver must be read, agreed to and signed before using the Range. You can click on the Green box below. When you get to Zack’s Sports to use the range tell a staff member you already read, agreed to and signed The Waiver. Our Staff will then check you in. 1. User of the Range must be familiar with any firearm used on the shooting range and must handle all the firearms in a safe and reasonable manner. Know your equipment. 3. Drawing from the holster is prohibited. 4. Rapid Fire is prohibited. 5. 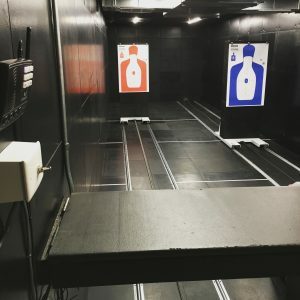 Loading and unloading of Firearms on the Range is permitted only when the Firearm is pointed downrange, in front of the ready line, at the assigned shooting stall. 6. No outside ammunition. All ammunition used on the range will be bought from Zack’s Sports. Absolutely no steel core, steel jacketed, tracer or incendiary ammunition/rounds. 7. Use of EYE and EAR Protection is Mandatory on the range at all times. 8. Wear appropriate clothing, closed toe shoes (required) and pants are recommended, no low cut tops. Baseball caps are highly recommend. 9. While on the Range, Firearms must be pointed downrange at all times. When leaving the firing line Firearms must be unloaded and cased. pointing down range, and obtain assistance. Do not leave the firing line with a loaded or jammed Firearm. 11. Brass/Empty cases are to stay on the Range. Picking up brass/empty cases is prohibited. You can use the squeegee to push brass/empty cases forward of the firing line. 12. Firing at other than approved targets will result in revocation of range use and range privileges, and liability for damages. 13. Negligent discharge, damages or injuries must be reported to the range officer immediately, no matter how minor they may seem. You are financially responsible for negligent discharge to walls, ceiling and floor. Please make sure you are aiming at the target before you press the trigger. 14. Never move forward of the firing line. If anything falls forward of the firing line, contact the range officer for assistance. 15. Use of the range while under the influence of alcohol or drugs is strictly prohibited. Persons believed to be under the influence of alcohol or drugs will be refused use of the range. 16. Smoking, eating and drinking is prohibited on the Range. 17. Remember to wash your hands after shooting. 18. In order to shoot a Handgun on the Range a NYS Handgun license is required. 19. No one under the age of 18 is permitted on the Range. accompanied with your NYS Handgun licensed parent or legal guardian. *Expectant Mothers are not permitted on the range.